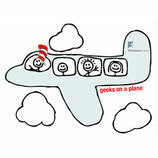 There is another Geeks on a Plane Asia tour with Dave McClure upcoming shortly! Kick-off will be in Shanghai on May 23rd and the tour will then continue through Beijing & Seoul ending in Singapore on June 2nd. You can find the basic overview here http://geeksonaplane.com/, details will be added shortly. The tour will incl. visits to the re:think event series in Shanghai, CHINICT conference in Beijing, Global Mobile Internet Conference in Beijing, Startup pitches in Korea and the echelon21 conference in Singapore. In between there will be Startup2Startup dinners hosted by Dave. For Shanghai we will post the agenda for May 24th re:think events shortly (sneak peak here http://shanghai.rethink.cc/). In the meantime I would like to invite you to check out http://shanghai.rethink.cc/2010/05/ignite-shanghai-is-may-24th-submit-a-talk/ and submit an idea for a talk! Ignite consists of short, 5-minute talks. We’d love all sorts of topics–anything that would appear to tech geeks or to the ReThink Shanghai audience.